← Dinner CHAYA Izakaya – September 23, 2018 – Venice, CA. 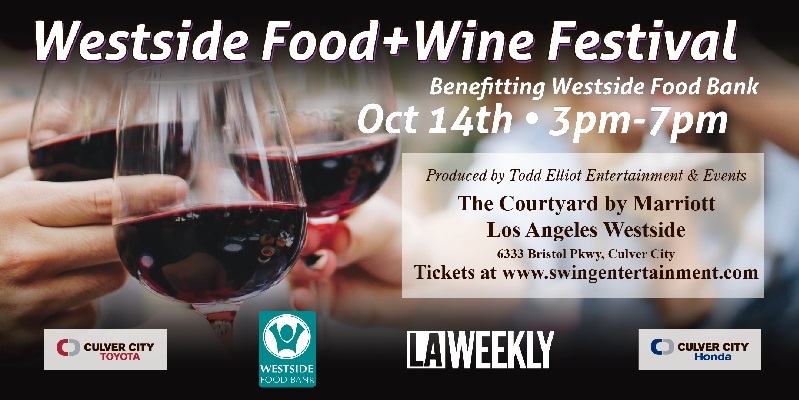 Sunday, October 14, 2018 – 3:00 pm – 7:00 PM – Los Angeles Westside Food/Wine Fest. benefits Westside Food Bank, by Producer & Organizer Todd Elliot Entertainment & Event Planning. At The Courtyard By Marriot – Los Angees Westside – 6333 Bristol Parkway, Culver City – Tickets at: www.swingentertainment.com. This promises to be one of the best food event of the fall season, come and meet me there!! !